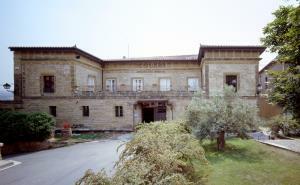 Hospedería de la Abadía de Nuestra Señora de Valvanera, run by a Benedictine community, is located in an area of great natural beauty. Surrounded by extensive forests and encircled by the summits of the San Lorenzo mountain range, it offers splendid panoramic views of the valley and peaks. The Monastery arouses great interest, not only due to its magnificent setting , but for its late Gothic church, devoted to the Virgen de Valvanera, patron saint of La Rioja. The serenity and tranquility of monastic life make this site the ideal place for a getaway, to relax amidst nature. 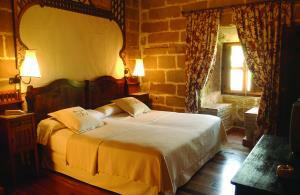 The Hospedería has 28 spacious double rooms, all of them with full bathroom and central heating. 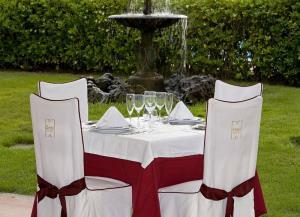 Its facilities also include a restaurant, bar and splendid meeting room. The situation of the Spa, in La Rioja, in the middle of nature, ensures the tranquility sought by everybody wishing to relax, as well as the possibility of multiple outdoor activities . 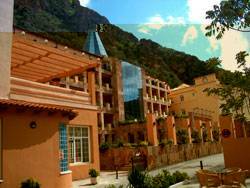 The Terma Europa Arnedillo resort consists of two Hotels. 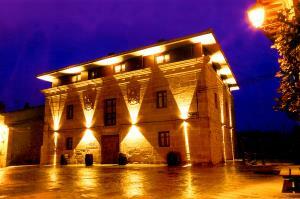 Hotel SPA****, with 133 A/C rooms , offers the convenience of its location in the same Spa building. It also has various rooms for meetings, incentives and banquets. Hotel El Olivar ***, with 45 rooms, about 300 metres from the Spa, and boasting unbeatable views. The Spa, featuring hyperthermal mineromedicinal waters, with soothing and anti-rheumatic properties, is one of the classics on the European spa circuit. Some of the services offered by Terma Europa Arnedillo are beauty treatments, antirheumatic, and relaxing. We must highlight its active swimming pool, the Roman bath and the wave pool. Club Forma Active swimming pool with 32º thermal water, indoor and with a circuit featuring jets, swan neck jets, counter-currents, Jacuzzi, and bubble beds. It also offers the possibility to swim outdoors. Recommended time 20 minutes. Roman Baths This is a circuit with hot and warm water pools, wet and dry saunas,interspersed with contrast showers. The ideal treatment for achieving the relaxation and tranquility required. Nursery At the Spa entrance. Thermal area Wrapping, baths, massages, Jet, circular shower, wet sauna, Vichy massage, inhalations and sprays. And the treatment that has made the spa famous since the early 20th century:thermal mud applications; Arnedillo being the only Spanish spa that still performs the mud maturation process naturally. 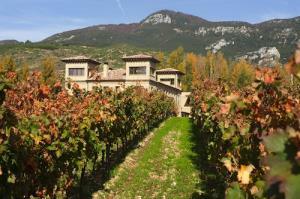 1 Km from Calahorra town centre, on the N-232, in in the heart of winemaking La Rioja. This charming hotel with 30 rooms ideal for spending a few days in the countryside, as well as for business purposes, stop along the way and enjoy a full range of services and comfort . 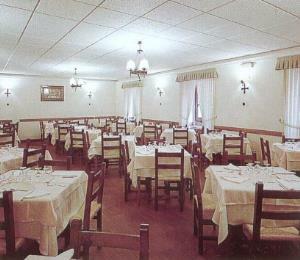 The establishment boasts a good restaurant, specializing in the traditional cuisineof this farming region. Own parking (20,000m2). With green are and outdoor swimming pool. 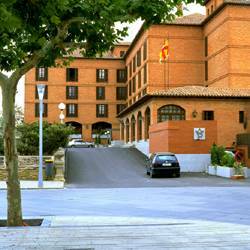 This red brick building contrasts harmoniously with the waters of the River Ebro and the Cidacos Valley. The dense vegetation of the garden, full of flowers and palm trees, forms part of one of the most important historical and artistic ensembles of La Rioja. Ancient Calagurris, of Roman origins, has its most representative monument in the Cathedral. Wide doorways, windows and shutters adorn a structure of soft lines that, inside, opts for a decoration of clear medieval influences. The work rooms are characterized by the spacious, modern and functional facilities. La Rioja cuisine is based on the quality of its vegetable produce, highlighting stewed vegetables, beans, lamb chops with peppers, and pears or peaches in wine. Dominican Monastery of Nuestra Señora de la Piedad founded in 1509 by the Bishop of Calahorra, Don Juan de Velasco. This Catholic Monarch-plateresque style Historic-Artistic monument was built in stone with important wooden ceiling and ornaments. The Hospedería is housed in the former Schools of San Nicolás and señoritas de Nuestra Señora de la Piedad, a true work of art in its day, for its huge dimensions and slender architecture. 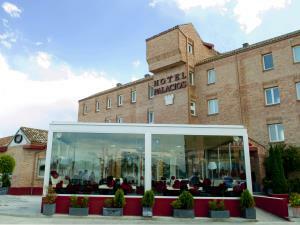 Located in one of the best enclaves of the town, rightly called the Aranjuez of La Rioja. The great walls of our country hotels hide corners and spaces conserving that cozy and warm atmosphere enjoyed by our ancestors, taking us back in time , and entertaining us with the visual play offered by its original decoration. Every weekend Wine Therapy treatments with red wine products for hotel guests. During the treatment, you'll enjoy a glass of wine from a local family winery. Antiaging and circulatory bath with red vine-cabernet sauvignon antioxidant cream. You will be left with an unforgettable sensation and really relaxed. Team coordinated and led by ANGEL RETANA.